Sony’s MOD program has essentially re-issued Twilight Time’s now out of print Blu-ray of Oliver!, winner of six Academy Awards in 1968 including Best Picture. Plot: After being sold to a mortician, young orphan Oliver Twist runs away and meets a group of boys trained to be pickpockets by an elderly mentor. Charles Dickens classic tale of Oliver Twist was adapted as a stage musical in 1960 and was such a success that in 1968 Romulus Films hired Carol Reed to direct a film version that was released by Columbia Pictures. It is a very familiar story; a young boy, Oliver Twist (Mark Lester), is living at an orphanage under deplorable conditions. Sold to a funeral home, Oliver escapes to London, where he meets the Artful Dodger (Jack Wild), who introduces him to Fagin (Ron Moody). Fagin runs a pick pocketing gang full of orphaned children who also fence items stolen by Bill Sikes (Oliver Reed). Will Oliver continue a life of crime living on the streets of London, or will he find a family to adopt and love him? The musical Oliver! has a special place in my heart, as it was the only musical in high school that I appeared in (as a member of the “adult” chorus), despite my being tone deaf and no real ability to sing. This movie version is pure magic, though, with brilliant and award-winning and nominated performances by Oliver Reed, Ron Moody, and Jack Wild (better known to US audiences as Jimmy from NBC’s H.R. Pufnstuf). Sony’s new MOD release appears to have the same transfer as the previous and now out of print Twilight Time release from 2013. For more details, see Richard Gallagher’s review of that disc. This appears to be the same DTS-HD Master Audio 5.1 track from Twilight Time’s release. For more details, see Richard Gallagher’s review of that disc. Many of the special features from the previous Twilight Time release have been ported over for this Sony MOD release, with the notable exceptions of the sing-a-longs, dance instructions, the isolated score and 8-page booklet. Original Behind the Scenes Featurette (1080i; 7:37): A very vintage and faded promotional film on the making of the movie. The Locations of “Oliver!” (1080i; 4:37): A look at the many real locations that were recreated on the backlot of Shepperton Studios. Meeting Oliver! (1080p; 14:45): Mark Lester discusses his role as Oliver in this 2007 interview. Meeting Fagin! (1080p; 13:24): Ron Moody discusses his role as Fagin in this 2007 interview. 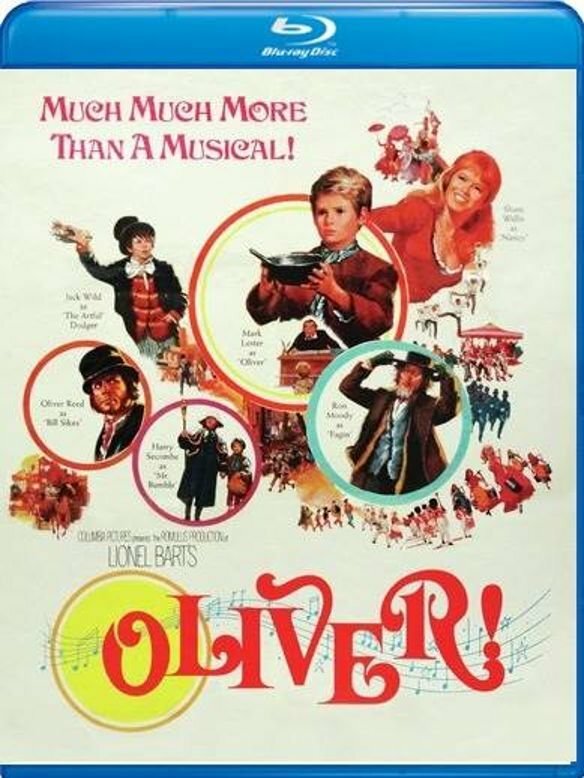 It’s great to see Sony release many of their licensed titles that have gone out of print on Blu-ray, and Oliver! is no exception. Todd – you appeared in Oliver! too as a small schoolboy? Ah, bless! I myself played the role of Oliver in our amateur school production about four decades ago. On the opening night performance for the parents , I was so overcome with nerves, I couldn't sing "Where Is Love?" for the life of me! My proud mother recorded the dreadful performance and she played it at a family gathering a few years ago. Ghastly, toe-curlingly bad. Like a cat yowling. My son was in hysterics. I've rarely been so embarrassed. The lack of the isolated score makes me very glad that I bought the TT version. Hopefully Sony will also reissue Blu-Rays of PICNIC and PAL JOEY. I love this movie and I will be buying this one. "Notable exceptions" in the bonus features, indeed. but I, for one, will never part with this unique and most valued edition from TT. This movie is awesome! One of the greatest ever. Perfection — great songs and truly terrifying in places. I always found Mark Lester just a tad a bit too soppy … though it's always amused me that Oliver's voice was in fact dubbed by Carol Reed's daughter! But visually, it is indeed simply wonderful. If you want to hear it as it should sound however, you must track down a copy of the original London cast recording. It's sublime. Never been bettered. And, as a bonus, that original cast recording features the great Barry Humphries as the undertaker, in 'That's Your Funeral'. Just wanted to mention in my very extensive cast album collection (both LP and CD), I had always been meaning to get the Original London Cast of Oliver! and for some reason had never gotten around to getting it even though it has always been important to me (possibly not important enough until today) to hear the score in its initial recording by its original cast. I rectified that omission this morning after being reminded in this thread that I didn't have it. Soon it will join its Broadway sibling on the shelf.